Affordable Accoutrements: Earthy Meets Ethereal -- Does it Work? If you’ve visited Affordable Accoutrements before, you know I like setting tables with elegant vintage china, sparkling glassware, cloth napkins, and flowers from the garden. This week I’ve decided to do a slight variation on that familiar theme. I’m using sturdy restaurant china, recently purchased at an antiques shop in southern Illinois. I always enjoy the challenge of juxtaposing everyday objects (often thrifted) with estate sale treasures that have the look of family heirlooms. It can be a delicate balance to achieve, one I hope I’ve accomplished for you today. The centerpiece is something of a recycling project. Last week, with very little blooming in the garden, I arranged a bouquet of aging flowers from the supermarket (reduced to $3.99). Surprisingly, most of the blooms still seemed fresh enough to use again today. I cut the stems short and did three small arrangements in soup/cereal bowls. The stemware is Caprice by Cambridge (1936 – 1958). The dishes were manufactured by Scammell China 0f Trenton, New Jersey. Date: circa 1925 – 1929. Caprice was one of Cambridge Glass Company's most popular patterns. In the June 1936 issue of China, Glass and Lamps, the Caprice line boasted over 200 items with more than 150 pieces in open stock. “Caprice – Beautiful, distinctive, patterned in circling ripples that achieve an entirely new Modern beauty, yet harmonizing with early periods. Designed to associate agreeably with your finest table setting." "Caprice -- like the enchantment of rippling water." "Caprice captures the whim of dancing lights for your table." These Bickford's plates were customized by using Scammell’s griffin pattern adding Bickford’s custom border and topmarked name. Southern Pacific Railways used Scammel’s griffin pattern in Daylight Blue (minus the customization). There was a time, not long ago, when a traveler could come to America by sail or steamship, cross the country by rail and stay in the finest hotels, and never once eat off a dish that was not made in Trenton, N.J. The Lamberton Works first opened in 1869 operating for several years before selling in 1888 to Thomas Maddock, whose family had been craftsmen and decorators for the Staffordshire Potteries in England for generations. While owned by the Maddocks, Lamberton Works produced some of the highest quality domestic and commercial china in the world. In 1923, a former office boy, D. William Scammell, along with his five brothers, purchased the plant. Under the Scammels, the client list and variety of wares rapidly grew. Prominent hotel and restaurant customers included the Waldorf-Astoria, the William Penn, and LaSalle, in addition to Macy’s and Gimbel’s department stores. During the heyday of luxury railroad travel, Lamberton Works created china for the New Jersey Central, Union Pacific, the Pennsylvania, New York Central, Southern Pacific and Baltimore & Ohio Railroads. It also provided its product for shipping lines including the Holland-America, the Norfolk and Washington Steamboat Co., Norwich Line, Panama Pacific Steamship and United States Lines among others. The Scammels successfully ran the pottery company until D. William died in 1952. Largely abandoned after the Scammell China Co. closed in 1954, what remained of the old factory burned down in 1972. For the next 20 years, the Lamberton name lived on as a line of china manufactured by the Sterling China Co. of Wellsville, Ohio, which purchased the equipment and ongoing contracts from the Lamberton Works in 1954. Lamberton Works pieces from both the Maddock and Scammell eras are much sought-after by collectors today. The napkins aren't vintage, but they did come from a local estate sale. They were priced at 8 for $4.50 (purchased for $2.25 the second day of the sale). One still had the department store price sticker folded inside -- $4.50 each. Bickford's Restaurants and Cafeterias were mainstays in the New York City area from the 1920s into the 1970s. Samuel Longley Bickford (1885–1959) began his restaurant career in 1902, and in 1921, he established his quick-lunch Bickford's restaurant chain. In 1959, the company introduced the Bickford's Pancake House family restaurants, followed by the chain of Bickfords Grilles (minus the apostrophe) which currently operates throughout New England. I "cheated," since I only have four Caprice tall water glasses. I filled in the end place settings with Fostoria's Wavecrest pattern (1935 - 1943). I've read that Caprice also was manufactured in 1935, even though the official introduction date is 1936. Many of the elegant glass companies of the Depression era created patterns that were similar to, and influenced by, others (just as automobile manufacturers, etc. have always done). The Wavecrest glasses still have their original Fostoria stickers. Obviously I'd remove them if I were using them to serve guests, but since they've "worn" them for 70 years or so ... I just didn't have the heart to take them off ... just yet. The silverplated serving piece below is a tomato/cranberry server, not included with most basic sets of flatware. The pattern is Fascination (silverplate, 1936) by International Silver. I like the clean lines of the deco-influenced design. The best minds of Allen Ginsberg's generation "sank all night in submarine light of Bickford's," he wrote in Howl. The Beat Generation muse, Herbert Huncke, practically inhabited the Bickford's on West 42nd Street. Walker Evans photographed Bickford's customers, and Andy Warhol rhapsodized about Bickford's waitresses. Bickford's made its way into the work of writers as diverse as Woody Allen and William Styron. Andy Warhol's assistant was out getting a coffee-to-go at Bickford's when Warhol was shot. The Mad cartoonist Wally Wood was 21 years old when he worked as a Bickford's busboy shortly after his 1948 arrival in Manhattan. I used open salts and individual pepper shakers on today's table. The salts were 6 for $5 at an antiques mall, and the boxed set of pepper shakers was a Goodwill find. Salt cellars, also known as open salts and salt dips, have been around for centuries. One was pictured spilled over in front of Judas in a painting by Leonardo da Vinci. It is only in the last century that they have disappeared from the table. Before salt crystals began to be refined by modern manufacturing methods, they were too big to sprinkle out of shakers like pepper. Therefore salt was served in open dishes. Then in the 19th century, just about the time the American Civil War ended, glass shakers with threading right in the glass were invented. Shakers with some sort of agitator inside to break up the salt became more common. Open salts did continue to be made and used for several more decades but almost completely disappeared by the time of the Great Depression. I placed an iced beverage spoon above each place setting, in case someone wants iced tea (and you thought I'd confused them with salt spoons, didn't you?). I'm always on the lookout for Caprice serving pieces. I prefer the goes-with-everything clear/crystal version, but the blue is extremely popular with Cambridge collectors. Another view of the table (with the overhead lights switched on). The Caprice candleholders are among my favorites. The flowing swirls capture the feeling of cascading water, don't they? Honestly Bill, you could take a plain white paper plate and make it look fabulous! This is as beautiful as always! I love the little flower arrangements and the restaurant china is just beautiful! It is elegant as always. And your photography just confirms what an artist you are. Gorgeous! ^ I'll second everything Anita said :) and just add that Caprice is one of my favorites among the glass patterns. Sure enjoyed the info about Bickford's too - thanks for the context around the china! OK I will third what Anita said! You inspire me Bill you really do! I have now fallen in love with Caprice and think it is my new favorite glass pattern! That restaurant china is spectacular! As always, Bravo!! Ahhhhh..... That is the emotion your table setting has evoked. I truly love the swirled glass...I am partial to the Fostoria Wave pattern. And the colors of the china and napkins are so warm. As I said....AHHHHH! Your arrangements are lovely, too. I love the way you extend your flowers' lifetime. So many people throw them away at the first droop. The candle holders remind me of the glass that is formed when lightning srtikes the beach sand. I think it all works very well together and another elegant table as always -- you do tables the way tables are meant to be -- the kind I grew up with for Sunday dinners OR when the parents had a dinner party! Elegant! I always enjoy visiting you for your tables are always magnificent! I look forward to your posts, I always learn so much! !Plus your table setting's are so BEAUTIFUL! Bill, I think you have accomplished your mission perfectly! Love your table, and your photographs are works of art. You do everything with an artist's eye, and it shows! I like how you recycled the centerpiece into smaller ones. I like to do that, too. But in addition to having an eye for china, crystal, and silver, you have an eye for just how flowers should look in an arrangement. Bill, your table setting couldn't be more perfect. I love the pattern on the Bickford's plates. Candle lit setting is enchanting. see my big smile? Anita said it perfectly, there is nothing to add! You can use everything and it will turn into a wonderful table with a magnificent atmosphere. But the glasses are so special, they add a very worthy touch to everything. Love the idea to use the flowers until they end. So Pretty!! I have a feeling you could make that black plastic container I heated my dinner in the microwave in, and served up setting on a potholder, on a plastic tray look good. :-D Not a cooking night and did not want to go out - what can I say. When I see your post on my dashboard of followers I immediately jump with excitement! And once again you have not disappointed. Bill, It is always a pleasre and an education to come to visit! I LOVE this china, can you imagine eating in a cafeteria and having this beautiful dish to eat from? Oh my they are wonderful. I would honestly love to have a set of these. I will be looking for these, my friend! YOur table and centerpieces are perfect, as usual! I always leave your posts feeling a little more refined! Your Caprice glassware is gorgeous in every light. No matter which picture, the swirls are so liquid and graceful. And the Bickford's china is adorable. I agree with Yvonne, I can't imagine eating with such lovely dishes in a cafeteria! What a wonderful find and what a wonderful table. My grandmother always set her formal table with salt cellars. You brought back memories, dear Bill. Your table is as outstanding as ever. Thank you. Hi Bill. 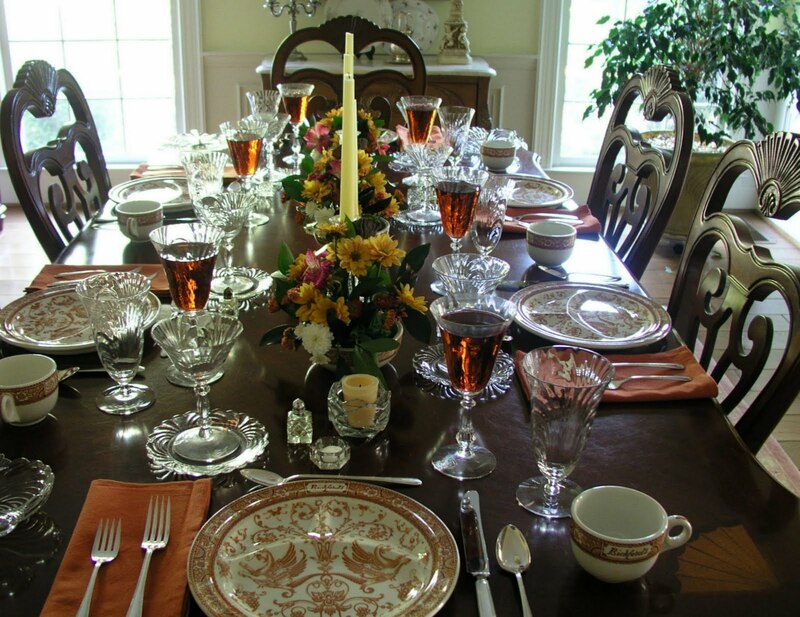 Your tablescape is Beautiful, and the china with your centerpices is just perfect. You know just how to put it all together great job. Bill, your photos are always GORGEOUS! Your tables are always elegantly beautiful! I really enjoy the history of the pieces you select for your tables. This is especially interesting, since I have found a little antique place near where I work that has several sets of "hotel" china. I didn't pay that much attention to them but because of your post I will go back and really LOOK! I am so jealous (but in a good way) of all the things you manage to "find" at sales! I have my great grandmother's "salts" and we used them last Christmas at each place setting as a holder for a chocolate covered cherry. Thank you again for such an interesting tablescape. I learn so much dropping in here. It's really a treat. Besides just oohing and aahing over the tables, of course! I love the dishes. I mean love the that hotel china. I still my salts with sel de mer in gray or pink tones. so much fun. Thanks again for a most inspiring post. I'm blessed to have found your blog. As always, just beautiful. Love the information on the open salt containers. I had heard that before but yes, I did laugh at your comment on the beverage spoons since I thought you confused them with salt spoons. The part I love about tablescaping the most is learning the history behind the dishes, behind the traditions or the salt containers for example. It somehow makes me feel connected to the past and it's a wonderful feeling. Those china plates... I'm in love with them! Great history lesson on everything. Thanks for sharing these treasures with us. there are so many things i love about your blog, aside from the sheer beauty of your tables. i appreciate the information you provide. and i especially am encouraged by the fact that so much of what you use, you have found at flea markets and thrift stores or seem to have accumulated over time. this is the way i must shop, as funds are limited right now. Were you a teacher in another life? I enjoy so much your knowledge of design and history and thank you so much for sharing. Makes me miss my art history classes. I absolutely love this china and had been so tempted to buy "hotel" china while living in Germany and unfortunately resisted. "Had I known then what I know now"...how many times I say this to myself after one of your tutorials. As always, a beautiful tablescape. You are an inspiration and your history lessons are a bonus. Thanks for sharing your knowledge and beautiful china. Wonderful as always. Love the griffin china, wouldn't that be fantastic with Central's Harding pattern? Beautiful! Of course your tablescapes always are. Spectacular post! I gasped when I saw the photo of the lighted candles with the 'blue hour' outside the window - Absolutely radiant. Thank you so much for sharing your talents. I appreciate the time and effort you put in to each and every one! Bill, your table,as usual, is a favorite of mine. I'm such a fan of stemware, after all. I have to say that THIS week the candles gave it the ultimate WOW factor. Just beautiful! These may be my favorite dishes yet. I love the color and the style. Perfect for those that don't like their food to touch! And the tidbit about open salt containers was really interesting! When you work your magic, even restaurant china looks elegant! The photography is wonderful, especially the night time shots! Love it all! Another beautiful table!!! I have never heard of Bickford's, but I love the china. I have never seen china that elegant that was sectioned. Interesting! The stemware is exquisite! Just glows in candlelight! Love the restaurant-ware dishes - the most beautiful I have ever seen! You did a marvelous job putting all these wonderful elements together! Does it work, indeed! It works beautifully, as always, Bill, and I enjoyed every photograph and every new fact that I learned. I've been thinking I'd like to have a set of salt cellars and now I know for sure. Thanks so much for your efforts. Hi, Bill, and thanks for stopping by my blog earlier this week! I appreciate your kind comments! I am really head-over-heels about the Bicksford dishes! What a great find! I absolutely love it that you didn't discard perfectly good flowers but chose rather to reuse them in different vessels. I also recycle, reuse, reduce...whatever the saying is! If they're still good to go, why not!? You knocked it out of the ballpark with this table, and your home, as always, is beautiful. Have a great week! Bill, love the table setting, as always...and this time even more so. It looks like an elegant dining room in an old historic hotel. I adore those plates! ...the design, and the food compartments! So unique!! And yes, all the photos are wonderful! Hi Bill, I'm so delighted that I stopped by for a visit. Your table setting's always amaze me, however, your evening photograph's are just stunning, I'm so enchanted with your table tonight. Thank you for sharing! Great table as usual. Thank you for telling us about the salts, very interesting! !Those flowers were good value to still have them. Those plates are delightful, why don't the cups have a saucer, are they meant to go on the plate too? Is it more like a tea plate we had when we went to a Buckingham Palace Garden Party where there were sections for sweet, savoury and a cup of tea /coffee on the plate ? Many thanks for a lovely table, great photographs, have a great weekend, "a Cougar"!! Just beautiful. I learn so much from your blog. I will keep my eyes open for Caprice. I will be looking for candlesticks this year as well. Gorgeous table, Bill. I love all the elements and how you used them. Wonderful centerpiece idea, I am making note of for future use. Bill, Your tablescapes are always an inspiration to me! I just love visiting your blog. This is a beautiful table. Thank you for sharing all the information too! Blessings! Bill, your table is just breathtaking. What a beautiful display of your treasures and so elegantly set to honor each piece. Thank you so much for sharing and for all the valuable information. Bill, I love your educational posts! I learn so much, plus we get to see more of your fabulous collection! Love the way you recycled your centerpiece from last week! It is always a pleasure to visit your beautiful table, and I really enjoyed the history lesson. I don't remember Bickford's, but it has been a while since i thought much about Kerouac and the others! The colors are beautiful, and in your hands, even the orange looks pretty! (Not one of my favorite colors). That is, without doubt, the most beautiful restaurant china I've ever seen! And I've seen a LOT - my mother collected all sorts of restaurant ware. Fab post! Love the history parts and you are right about Trenton supplying so many goods -- there's still a bridge over the river in Trenton, with the legend on it: "Trenton Makes. The World Takes." Porcelain, from Lenox to American Standard toilets, and so many other companies -- that was Trenton's livelihood! Thanks for a great read, fun post, and gorgeous setting! I love those divided plates. My family always teases me because I really wish all plates were that way....I don't like my food touching. You should try to get to Phoenix sometime in the fall, winter or spring!! You would enjoy it...Avoid like a plague in the summer!!! I think this is the first time that I have seen the Caprice crystal...thank you for sharing some of your beautiful pieces with us and a little of the history of Caprice! Ohhh my...the candleholders ARE gorgeous! They really do look like beautiful waves of water...simply stunning! The Schammell china is also really beautiful. The griffin pattern is quite exquisite and I love the earthy burnt orange/brown color of it! You have created a gorgeous table, Bill and I really enjoyed all of your fabulous photos! I love how you do all of your candlelight photos...that crystal just sparkles in the candlelight! Thank you for sharing your fabulous table with us! Thank you for stopping by my place for a visit. I really enjoyed your note, my friend! Bill,I am always so unsure about my casual tablescapes,they just don't compare to your's.I was so happy and excited that you visited LazyonLoblolly and your comment is so appreciated,I lack alot of self confidence when it comes to tablescaping,I hope to improve as time rolls on.Again thank you so much for dropping by,please don't be a stranger.And thanks for the "vote" of "yes" on the "blue hour". This is so beautiful and those dishes are wonderful! Your home is truly a treasure. I have a little secret to tell you. Tomorrow I'm having Heather's donor Robert and his family over for dinner. It's the first time we will be meeting and I'm super excited. I'm very grateful this wonderful man is helping Heather. The transplant is a few weeks away and I'm praying everything goes textbook perfect. I'm planning on doing a tablescape post about the dinner. Thank you again for your kind words and encouragment they mean alot. Take care. Bill, every table you set is a feast for the eyes, and this one is no exception! And not only did I see beautiful things but I also learned a lot as well, thank you! I think I was born in the wrong era sometimes, because I would so love to travel and dine the way they did years ago, it must have been wonderful! Bill, fabulous tablescaping post, love the way you creatively weave the design complete with lots of details about history on everything. Have a great weekend. You are so talented at this Bill! What a beautiful and elegant table with a wonderful story to boot! That restaurant china with the slight indentations would be wonderful for my youngest grandson, who HATES to have any of his food touching. LOL The pattern is very pretty...griffins are timeless, just as that Caprice pattern on the stemware. Beautiful! You're right about the Fascination design...it does have an Art Deco feel to it, with the stacked edges in the pattern. I have a tomato server with one of my sets & never thought of it as a "cranberry" server until today. You just convinced me about what set I'll be using on Turkey Day! Your evening photos are always such a treat. I always come away from your blog, inspired, informed & invigorated! Thank you for the lessons on both Bickford's & salt cellars. I repeat, YOU SHOULD WRITE A BOOK!!!!!!! What gorgeous china, and what a stunning tablescape!!! I am so in love with the china and all the glass....so interesting, all that information! Bill, this is sooo gorgeous! I love that china...the pattern is sooo pretty and the napkins are just perfect with the colors. Thanks for the history...I'm in awe that you are able to find all that wonderful info to share with us. I love the candle holders, too...the way they are designed with the different heights...sooo elegant! Candlelight is just magical in your dining room!